Toronto is the capital city of the province of Ontario in Canada. 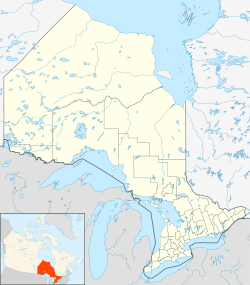 It is also the largest city in both Ontario and Canada. Found on the north-west side of Lake Ontario, the City of Toronto has a population of over 3 million people and even more people live in the regions around it. All together, the Greater Toronto Area is home to over 6 million people making it the biggest metropolitan area in Canada. Toronto was created in 1793 by John Graves Simcoe as the capital of what was then called "Upper Canada". At the time it was called the "Town of York" after the Duke of York, but was given its current name in 1834. With the Canadian Confederation in 1867 it became the capital of the newly created province of Ontario. Toronto was one of two cities (along with Montreal in Quebec) that wanted to be the capital of Canada, but Queen Victoria decided that Ottawa should be the national capital as it was located between the two. As the 19th century moved on, the city began to grow. This was mainly because of immigration, where people from all over the world left their home and moved to Canada. Many of the immigrants were Irish and they brought their Catholic faith with them when they left Ireland because of the Irish Potato Famine. During World War I and World War II, Toronto had an important part in military, being used to train members of the Canadian Army. After the wars, even more immigrants came to the city. The population was becoming so big that the Government of Ontario decided to create Metropolitan Toronto in 1954, joining together a number of local municipalities. These were Old Toronto, York, East York, North York, Etobicoke, and Scarborough. By 1981, Toronto had more people than Montreal even though it was created after Montreal. So the Ontario government decided to make Toronto a "megacity" in 1998, and the first mayor of Toronto was Mel Lastman. As Toronto moved into the 21st century, it became host to a number of worldwide events, such as World Youth Day in 2002, WorldPride in 2014, and the 2015 Pan American Games. On April 23, 2018 a white van collided with numerous pedestrians killing nine and injuring sixteen others at Yonge Street. As the biggest city in Canada and one of the biggest in all of North America, Toronto is a popular destination for tourists. It is where you can find the CN Tower, the tallest free-standing (not supported) structure in the Americas and one of the Seven Wonders of the Modern World. There are some other buildings, such as City Hall and the Rogers Centre, that are well known for their design style. There are also many skyscrapers, because many large banks of Canada and other companies have their main offices in Toronto, and the Toronto Stock Exchange which is the biggest stock market in Canada. Because Toronto is the capital of Ontario, it is where the provincial government meets, and visitors can see how the province is run by visiting the legislature in Queen's Park. There are also a number of museums, including the Royal Ontario Museum, the Art Gallery of Ontario, the Ontario Science Centre, the Hockey Hall of Fame, and the headquarters of the Canadian Broadcasting Corporation. In the suburbs of the city is the Toronto Zoo and Canada's Wonderland, and many visitors also like to go to Niagara Falls, just an hour's drive away from Toronto. Toronto is full of places to visit, eat, shop, and enjoy. In the downtown area are a number of shopping centres, including the Eaton Centre, St. Lawrence Market, and the Distillery District. There are also several theatres, many which are run by the Mirvish family. The Four Seasons Centre for the Performing Arts, opened in June 2006, is home to the Canadian Opera Company and the National Ballet of Canada. Across the harbor are the Toronto Islands, the best-known of which is Centre Island. Toronto has many sports teams, some of which belong to the most commonly-followed leagues in North America. They include the Toronto Maple Leafs in ice hockey and the Toronto Raptors in basketball, both of which play in the Air Canada Centre. The nearby Rogers Centre is where the Toronto Blue Jays baseball team plays, and meanwhile, BMO Field in Exhibition Place is home to the Toronto Argonauts in Canadian football and Toronto F.C., a soccer club. Toronto is a very multicultural city, because different people from around the world have moved to Toronto to live since the 20th century. There is a Chinatown, Little Italy, Little Tokyo, Greektown, Little Portugal, and many more places where different cultures are kept alive. These people hold festivals where they share their culture to others, and among the most popular is the Canadian National Exhibition (CNE), which happens every year in August. Like many cities around the world, Toronto has an airport, from which there are flights to many places in Canada and the rest of the world. It is called Toronto Pearson International Airport and it is just northwest of the city centre, which people call "Downtown". Since 2015, there is a train service, the Union Pearson Express, that goes from the airport to Downtown in less than half an hour. The CN Tower, as seen from the Rogers Centre during a baseball game. The Ontario Legislature is where the provincial government meets. Toronto City Hall, where the city government meets, is on the left. On the right is Old City Hall, which is now an appeals court. The St. Lawrence Market is a busy indoor market. Many people buy fresh produce, meat, and seafood here. There are many museums in Toronto, such as the Royal Ontario Museum. The Hockey Hall of Fame is a museum about ice hockey and many of its famous players. Toronto's Chinatown is one of many places where immigrants live and their culture is kept alive. There are many parks in the city. One of the big ones, just west of downtown, is called High Park. In Scarborough, a suburb of Toronto, there is the Toronto Zoo, where many animals are taken care of. Yorkdale Shopping Centre is just one of many large shopping malls outside downtown Toronto. This is Mississauga, one of the cities near Toronto where people live. They commute to work in Toronto. Niagara Falls is a popular tourist attraction not far from Toronto. ↑ Austen, Ian; Stack, Liam (April 23, 2018). "Toronto Van Plows Along Sidewalk, Killing 9 in 'Pure Carnage'". The New York Times. Retrieved April 23, 2018. City of Toronto - Official city website. Tourism Toronto - Visitor's bureau website. This page was last changed on 19 April 2019, at 23:06.